Reflections on how to wear a cape to get noticed, from The Magnificent Chameleon! Ok, so I am a bit of a thespian, and I have been known to dress up in odd stuff and prance about on stage, but usually the stage is the limit of my dressing up activities. 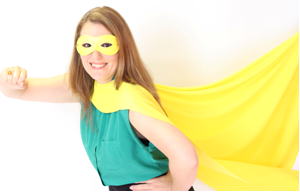 However, in the recent past I’ve been proudly parading around the NEC in Birmingham wearing a yellow cape and superhero mask, all in the name of business development. Before our two-day stint at World of Learning, showcasing ‘Pants on the Outside’ to the movers and shakers of Learning & Development, I wasn’t fully aware of the benefits that wearing a cape in public can bring. I certainly am now!! Here’s the first in a series of 5 posts about the benefits of wearing capes! Benefit #1/5 – It’s a real conversation starter.